HSUS raises well over $100 million a year. And it does so deceptively, as we recently informed the Attorneys General of 25 states. But HSUS is one part of the animal rights movement. There are a whole host of other groups as well, from PETA to lesser known groups with a more specific focus, like the Animal Legal Defense Fund. While these groups are generally not legal affiliates, they’re all on Team Vegan. Go to one animal rights conference, and you’ll see them alongside each other debating the means, but not the end. The end is to stop the use of animals for food. How strong is the animal rights movement, and who are the players? We’ve gone through the most recently available tax returns for two dozen groups. 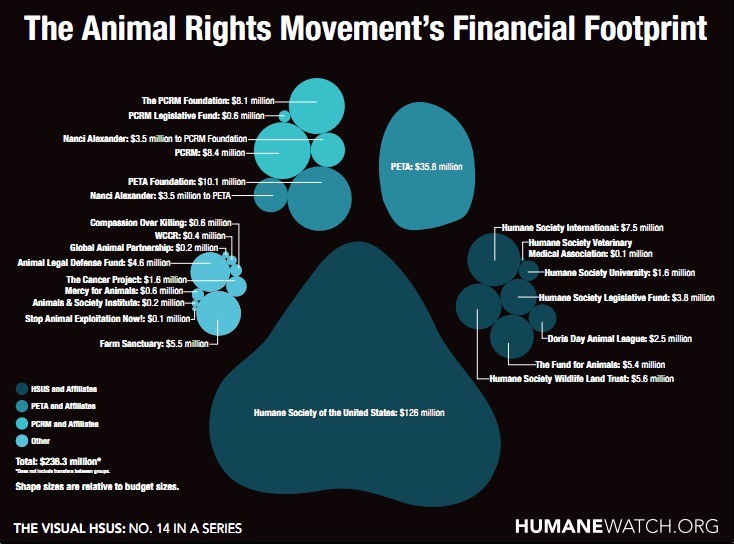 While it’s not every animal rights group, it should give you an idea of the movement’s general composition and budgetary means. HSUS often attacks animal agriculture by asking people to reduce their environmental footprint by eating more vegan meals. (Reality check: Farmers have already been reducing their footprint.) If you want an opportunity to reduce HSUS’s financial footprint, be sure to spread the word about HSUS and this website. Our ad that recently aired during the Olympics Opening Ceremony is a good start.